Periodically analysts ask for the details of SanDisk’s wafer production. Invariably SanDisk notes that it doesn’t provide numbers. That said, SanDisk does provide hints, which over time give the broad outlines of production numbers. Time to give that one a shot. Interesting angles too. Especially the sale of wafer capacity to Toshiba in early 2009, and why the numbers don’t seem to reconcile. Before getting to those stories, the stage should be set. Wafer production in 2007 was primarily a Fab 3 story. Almost a Mega-Fab, Fab 3 has a capacity of around 150 K 300mm wafers per month (150,000 wpm). 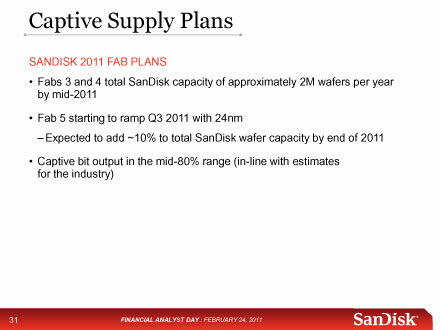 Fab 3 reached maximum capacity early 2008 as indicated by the slide below from the SanDisk Analyst Day in February, 2008. At that time, Fab 4 was projected to ramp to 110K wpm in 2H08, also noted on the slide above. In the second half of 2008, the SanDisk/Toshiba joint venture had a capacity of 150K wpm from Fab 3 and 110K wpm from Fab 4 for a total capacity of around 260K wpm. All this production was split 50/50 between SanDisk and Toshiba. Each had 130K wpm. 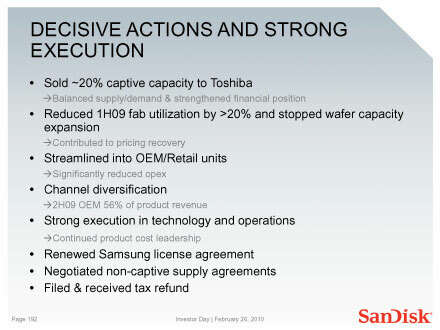 In January 2009 SanDisk sold ~20% of its captive capacity to Toshiba as indicated in slide 192 below from Investor Day 2010. The loss of 20% of SanDisk’s wafer translates to 26K wpm and a capacity drop to 104K wpm for SanDisk and a gain for Toshiba to around 156K wpm. The captive capacity sale was valued at $890 million. SanDisk received about 1/3 in cash and 2/3 in reduced equipment lease obligations. At the beginning of July 2009, Toshiba turned around and entered into a long term NAND supply agreement with Apple. Apple made a $500 million prepayment to Toshiba. Not a bad deal all around. Knowing Apple, they got a sweetheart deal. Cash-strapped Toshiba got the bucks back it had to shell out to SanDisk. SanDisk was able to strengthen its balance sheet and reduce NAND memory production commitments. If there was anyone left on the outside looking in, it was Samsung. SanDisk had escaped its clutches. Toshiba wasn’t crippled in lending its partner a hand in its time of need. And to rub salt in the wounds, one of Samsung’s best and most promising customers, Apple, had a supply deal with Toshiba- the competition. It’s important to remember that these were days of oversupply. My guess is that Apple, Toshiba and SanDisk were all betting that NAND oversupply wouldn’t last long. If so, they were right. By the end of 2009, NAND had swung into under-supply. Toshiba and SanDisk had a low-cost ace-in-the-hole in Fab 4. The wafer capacity SanDisk sold to Toshiba and which in turn Toshiba dedicated to Apple, could be made up and then some, by finishing off Fab 4. It’s worth noting that no capacity had been added- 2009 to mid 2010. Mid 2010, the Fab 4 push to completion began. This additional 100K wpm capacity is to be split 50/50 between SanDisk and Toshiba, and will be complete by mid 2011. At Analyst Day 2011, SanDisk noted that by this milestone, mid-2011, its wafer capacity will be 2M wafers/year or 167 K wpm. See slide 32 below. The numbers don’t add up: 104 + 50 ≠ 167. There are many explanations for the missing 13K wpm. Personally, I am partial to the possibility that somewhere along the line, SanDisk and Toshiba had a meeting of the minds and worked out an unannounced deal whereby SanDisk bought this capacity back. In any case, mid-2011, when Fab 4 is complete we know it will have a capacity of 210± wpm. This number added to the 150 wpm from Fab 3, gives the SanDisk/Toshiba JV a capacity of 360± wpm. If SanDisk claims 167 wpm, that leaves 193 wpm for Toshiba in 2011, before Fab 5 is accounted for. SanDisk has been waffling between 5% and 10%, for what Fab 5 will contribute to 2011 capacity. At Analyst Day 2011, it’s was back up to 10%, which translates to another 16K wpm for SanDisk (rounding down) in 2011, bringing its total capacity up to 183K wpm from Fab 3, Fab 4 and Fab 5. When complete, Fab 5 will be about the same size as Fab 4, ~210K wmp. SanDisk can claim half of that, which it appears ready and able to do. At Analyst Day 2011, Judy said that Fab 5 Phase 1, about half of the total Fab 5 capacity, was expected to be complete at the end of 2012. If this is how it goes, at the end of 2012, without any other capacity buy-backs, SanDisk will have a wafer capacity of ~217 wpm. Toshiba will have a capacity of ~243 wpm. One of Sanjay’s big points at February’s Analyst Day 2011, was that almost one in two NAND bits produced in the world today, is being produced by the SanDisk and Toshiba joint venture. At the end of the day, all this math and speculation just means that SanDisk is nicely positioned to maintain it’s market share- as the Post PC world arrives. Make of that what you may. There are other ways to figure the wafer permutations of the past- or how SanDisk has reached its current baseline wafer capacity. The numbers used for Fab 3 and Fab 4 are probably more fluid than public announcements might indicate. Fab 3’s capacity is purportedly 150K wpm and Fab 4 210 wpm. If, for example, Fab 3 has been pushed up to 160K wpm and Fab 4 will be able to reach 220K wpm, the extra 20K wpm – split between SanDisk and Toshiba pretty much erases the need for the awkward scenario of the off-the-record buyback of capacity outlined above. Whatever has happened in the past in this regard, is over and done with now. We have our baseline to work off for SanDisk, because SanDisk has announced that by mid-2011 its wafer capacity will be 167 wpm or 2 million wafers per year. Split this up as you will, but both Fab 3 and Fab 4 will be fully utilized and their wafers out at full utilization have been announced and we know the broad outlines of Fab 5’s ramp. Toshiba’s share might be a bit more than 193 wpm or a bit less. Figuring out the specifics of what that is, well, a problem for others. 2 million wafers a year is a whole lot of wafers to control. Lots of leverage in controlling ~20% of the world’s NAND bit supply, which is what these numbers boil down for SanDisk’s market share. It will be interesting to see what SanDisk comes up with. This should be quite the opportunity. No doubt SanDisk’s Chief Strategy Officer, Sumit Sadana, has been carefully weighing his options. NAND is simply a commodity in times of oversupply, but in tighter times like these, it becomes a strategic material. This entry was posted on Sunday, March 6th, 2011 at 4:45 pm and is filed under Uncategorized. You can follow any responses to this entry through the RSS 2.0 feed. You can leave a response, or trackback from your own site. I recently heard, second hand, that SanDisk’s problems in Japan only appear to be logistics and transportation. The issue seems to be getting chips to China for packaging etc. I’m confident that SanDisk can figure out how to get their chips from here to there. If this is as tough as it gets, its time to exhale. The wafers/chips themselves are the concern. If, as it sounds, the fabs 3 and 4 are pumping wafers out on schedule, all should be well. The Yen exchange rate looks like its going to swing wildly for a while. Lots going on. Ultimately it looks like it will weaken, which would be a positive for GMs. We shall see. I’ve been thinking that the next node down for SNDK/Toshiba below 24nm would be 20nm. Eli hinted as much a while back. Micron/INTC is targeting 20nm as their next step down. Recent rumors suggest that SNDK/Toshiba might be under 20nm. If SanDisk/Toshiba were to go to say 18nm, at the end of 2011, this would be a big deal- industry leading. If SNDK/Toshiba only go to 20nm, that’s OK too. Tie goes to the volume leader- which would be SNDK/Toshiba. In any case I suspect that SanDisk/Toshiba will lead in the next leg down beyond that. At Analyst Day, SNDK sounded very confident. We shall see. Thanks for the update. Not sure, though, why you say “Micron/Intel s targeting 20nm as their next step down,” since Intel isn’t investing in Singapore, and is busy selling off their stock in Micron. I also don’t think that Micron being at 20 is that big a deal (if, in fact they do get there ahead of Sanshiba) compared to Sanshiba at 24. Aside from the fact that x3 at 24 is probably more cost effective than 20nm, there is a lot more to cost than what node you are producing at. And I’m not sure that the difference between 24 and 20 is so great that, IMHO, it is really worth going through a transition for. Unless it is very speedy, cheap and painless. I think Micron is going from 26 o 20 as much for bragging rights as anything else. The fact that they have had some of their production at 26 vs. Sanshiba at 34 doesn’t appear to have given them greater margins in NAND than Sandisk. Bragging rights looks nice in print, but it isn’t worth anything in margins. Micron saying they are soon going to be at 20nm isn’t a big deal. Words are cheap. Smoke and mirrors are cheap. MU has yet to show X3 competence. Telling. Intel is back pedaling as fast as they can. Pretty much as expected. That partnership is history. To my mind the last nails in coffin were recent reports that INTC is no longer even designing their own SSD controllers for their latest chips. I included Intel along with Micron for upcoming chip design targeting 20nm, because Intel still has R&D obligations, even for Singapore for a while yet. The bigger deal to my mind is the SNDK/Toshiba roadmap. Hints are a plenty that the dynamic duo have figured something out. SanDisk/Toshiba appear to have accelerated the transition to 1x- by a full year. At the 2010 Analyst day 1x was shown starting late 2012. 1x is now scheduled to begin late 2011. Eli has described 1x as 20nm or a little bit under and 1y as closer to 15nm. Recent rumors seem to indicate that SNDK/Toshiba will be going to 18nm as the next step down below 24. Atif Malik of Morgan Stanley seemed to have hit a nerve when he outright asked Sanjay, if Fab 5 would start with 18nm in the Q4 2010 cc. Sanjay’s response was no comment. SanDisk/Toshiba appear to have figured something -Big- out. And they have a roadmap through 1ynm- without EUV. 1ynm is now scheduled as a mid-year 2013 event [page 167 FA Day 2011]. The lower the geometry with existing tools, the better the GMs, especially if SanDisk/Toshiba are ahead of the pack. Wafers out isn’t, by far, the only variable that leads to increased bit production, which is what you really want to see. Fab 3 wafers out might be 150K, but that is on 8 inch 200mm wafers. Each wafer from 300mm wafers from Fab 4+ are 2.2x the bit of fab 3. Also SNDK/Toshiba still produces some SLC vs. MLC and then there is 3 bit…Also, the Fab 3 200mm wafers are not on advanced geometries. It is static and I think it ended somewhere in the 50s. That said, I’m a big fan of Sandisk, and I agree, they have a long good roadmap ahead of them. I agree with you about bits being more important than wafers. From a bit production perspective Toshiba/SanDisk is king of the hill- probably shipping close to 30% more bits than Samsung in 2010. X3 will do that for you. I’m not so sure about your Fab 3 info. 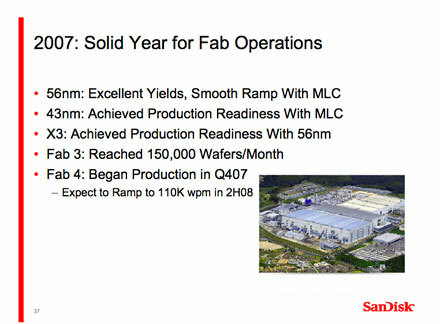 The last mention I know of 200mm wafers in Fab 3 – from either SEC filings and SanDisk presentations – is 2008. All references have been 300mm since that time. The recent weakening of the Yen is a big deal (positive) for SanDisk if this becomes the lay of the land for the next stretch. SanDisk had been resigned to the yen having an unfavorable impact on costs in 2011 relative to 2010, thus putting pressure on gross margins. In the Q4 cc SanDisk said that a five percentage move in the yen can cause about a two to three-point movement in the gross margin percentage. All of us were anticipating this would be negative. In some respects this wafer post was excuse for me to take the time to sort through SanDisk’s comments over time on wafer production, to see if I could stitch together a coherent story. I’ll probably put up a postscript this weekend and call it a day on wafers for a while. The puzzle that has my attention is what SanDisk/Toshiba appears to have figured out on node transition below 20nm. A year ago, much below 20nm was going to require EUV and hence be difficult, expensive, and time consuming. Time will tell whether all players will enjoy this same roadmap. Not a big deal if all have the same advantages. But a big deal if not. I just put up a postscript on this wafer production post. With this I will call it a day on wafers for a while. As noted in an earlier comment, bits are far more important to track than wafers. From a bit production perspective Toshiba/SanDisk is king of the hill- probably shipping close to 30% more bits than Samsung in 2010 thanks to X3. Suffice it to say that Credit Suisse thinks NAND in the Enterprise is going to be bigger than people think. In-memory columnar databases have the potential to fundamentally transform enterprise applications. I keep wondering what SanDisk’s Enterprise strategy will be- if any? We have had hints that something might be up. But so far nothing has come of it, or at least nothing announced. At a minimum, I am inclined to think that SanDisk might be at work on partnerships or at least strategic relationships. It looks like the future will evolve along the lines of the PCIe card rather than the traditional HDD form factor. This means the Fusion-io’s of this world look far better positioned than the STECs. Besides partnerships or strategic relationships, SanDisk could make bigger waves by selling its own products directly to the Oracles, SAPs, or IBMs. Or SanDisk could make an acquisition which would give it the required expertise. Turning the question around, SanDisk itself could be an acquisition target for an enterprise storage player. In any case, if NAND in the Enterprise turns into an upside surprise, SanDisk will profit simply because that much more NAND will be consumed and the supply demand balance will be that much healthier. Hi Savo, can you post theose research reports are they protected from distribution by contract? The enterprise market looks tailor-made for SNDK’s technical expertise doesn’t it? By “In-memory columnar databases,” I assume you mean 3D or TSV (through silicon vias) right? There’s been lots of recent chatter about that lately. Lastly, what about Japan supply chain worries? Do we have to wait until 4/21 to hear about them or do you have an idea? Thanks. Savo, I realize that I may have used up my question quota, but your mention of Fusion-io made me wonder what their impending IPO will do for NAND/SSD companies. Any thoughts on what sort of valuation they will receive, and whether they actually complete their IPO or are acquired by a larger company first? I’ve been meaning to get back to you, but I’ve been a bit distracted lately. FWIW, my guess is that the Fusion-io IPO will be a good thing for the NAND/SSD companies. The enterprise SSD segment is going to be really big for lots of reasons. Its going to take lots of NAND to feed the beast. And there will be lots of opportunities from many angles for folks like SNDK. The Fusion-io IPO will help focus attention and Fusion-io looks tailor-made for the media: High performance product, leading edge design and high profile folks- Marc Andreessen, Steve Wozniak etc. And Fusion-io has Facebook as its largest customer. Other customers of note: Zappos, MySpace, Wine.com, Answers.com, and the Lawrence Livermore National Laboratories. For context, STEC has a market cap of around $1 billion. And STEC has issues. As no doubt you are aware, the Fusion-io IPO could be a feint to drive up its valuation for an acquisition offer. Not a bad strategy. Particularly if Fusion-io isn’t built to last. At least some Fusion-io talent has moved to Violin. I will post excerpts of the Credit Suisse 30 March overview report if and when I get to this story line. Marty, the in-memory databases Savo referred to are the largest enterprise database systems where the data is stored online in flash memory rather than being read/written back and forth to hard disk drives (which slows performance). This would have been cost prohibitive in the past, but the decreasing cost of flash drives should make in-memory databases more widespread. Thanks Puppy. Perhaps SNDK should be pivoting more aggressively into the enterprise space, as they recently pivoted from direct consumer into oem. It looks like many businesses will be needing a LOT of flash in the future.